Nama-Stay is a journey and a destination. A place of LOVE with rich, wide-open views, designed to be in harmony with nature, surrounded by the beauty of Zion National Park in Springdale, Utah. This beautiful Springdale vacation rental gives you the comfort of a true sanctuary. 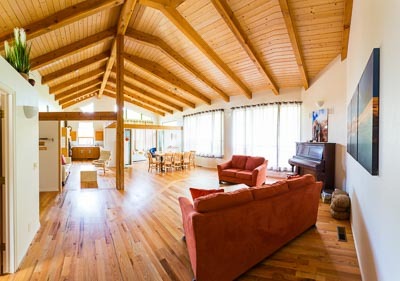 At Nama-Stay Vacation Home Rental and Retreat House you are in “downtown” Springdale, UT, 5 minutes from the Zion National Park south entrance, shuttle buses, grocery stores, restaurants, galleries, and an array of outdoor adventure activities. And yet, you are far enough from the road to have a sound, silent sleep. Come visit us! Terraced backyard patios with seating for groups large & small. Majestic views of the brilliant red mountains of Zion National Park soaring 3,000 feet overhead. Sleeps 8: Three Bedrooms + Sunroom, 2.5 Baths. Hardwood floors, open layout with vaulted ceilings, 8 ft. picture windows and extensive front and back patios. Full Kitchen including cookware and place settings for 8, BBQ Grill, WiFI + Ethernet, Music & Video Library, Washer & Dryer, Parking for four vehicles. A home for soulful stay, play and practice. A pure energy place, that brings out the best in people. Ideal for retreats and a wonderful playground for families.